When Alexander discussed this film, his qualifiers had qualifiers and his comments were specifically in relation to the bête noire of film critics everywhere: being able to partition one’s nostalgia-driven prejudices and accept the new. This can be very difficult, as childhood reminiscences invariably creep in like some many tentacled creature ripped from the pages of Lovecraft. This review is an attempt to approach Evil Dead unfettered by such things (This reviewer came to the series late, enjoyed them all a lot, but wouldn’t place any of them in his Top 10). The prospect of reviewing the reboot was met more with a meh shrug and “here comes another sub-par remake” rather than a fanboy expecting to administer last rites to the series, potentially ruined by the imprimatur of Sam Raimi’s hand-picked Johnny Come Lately director (an obscure Uruguayan, Fede Alvarez). No biases here, rest assured. But that being said, this is more of an Evil Dud. Without so much getting into whether it captures the essence of the earlier films (when it comes to the haphazardness and the humor unequivocally NOT) Evil Dead suffers the same fate as the reworking given to that stinker Prom Night: a cast of extremely good looking people as two-dimensional as a Greek fresco. Say what you will about Prom Night (and we did, getting in a few shots well after being separated by the ref) but even if the plot was stupid, the killer terrible and the setting worse, at least the cast had good rapport. Evil Dead’s cast comprises a bunch of bloody irritants, especially busybody Eric (Lou Taylor Pucci) who sports a hairstyle like an apprentice squire from Medieval Times (see, below). A dynamite idea gets these people together and isolated though: some tough love for Mia (Jane Levy) via a heroin intervention. Unfortunately, taking someone out to what is the creepiest cabin in the woods imaginable can’t be good for one’s psyche or prospects for a recovery. Put the book out with the recycling, you idiot! Soon — but not nearly soon enough as the smell could’ve knocked a vulture off a compost heap — their noses lead them to a bunch of rotting carcasses in the basement. Instead of having the place condemned and selling off the property to the highest bidder, they read passages from a book found nearby: Naturom Demonto. Not good. Nasty ghouls are unleashed and well, you know the rest. The movie looks great, and the practical effects are incredible (one character gets her arm gloriously severed with an electric carving knife. Really? THAT is a device you take with you to a cottage where the diet usually consists of mac and cheese and re-fried beans?) 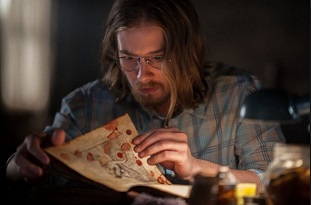 And to Chris Alexander’s comment, it’s a relief to see a mainstream horror go for the gore gusto when producers are usually content to mine the supernatural vein a la the tepid The Forest. 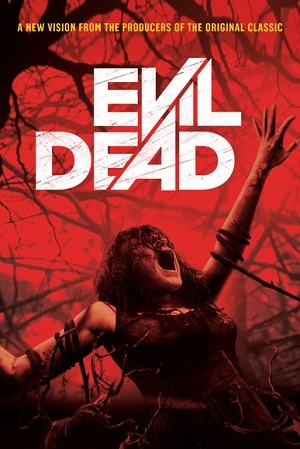 From cabins to another type of dwelling…Evil Dead is a bit like a prefab housing development. Sure, the homes are large, new and nice but there’s just no personality or way to distinguish it from any others. Best to stick with the groundbreaking original. This entry was posted in Horror and tagged 2010s movies, remakes by Really Awful Movies. Bookmark the permalink. I’m completely on board with you with this review. I like the original movies (the first one the most, but didn’t love it like some. I didn’t find the remake personally insulting, just kind of uninteresting. Still haven’t bothered with this remake. Keep telling myself I am. Just haven’t been able to make myself watch it. After reading this, I’m still not in a hurry.